Laminated Kennel Tag Holders, Works on Luggage too. USE simple household Iron to seal if laminating equipment is not available. IATA and Airline required. All kennels & carriers must be labeled with pets & owners name. Comes with our Name tag to add Pet's & Owner's Names, But any business card will fit. Great For Cat & Dog Breeding Kennels who ship Puppies & Kittens. Enter your pets info and upload a picture then download, print and cut out. 1. Use the following items: DryFur Kennel ID Tag, a business card or any ID tag that will fit inside, clear laminating pouch, an iron and a cotton tee shirt. 2. Turn on and set the iron to cotton blends and let it warm up. 3. 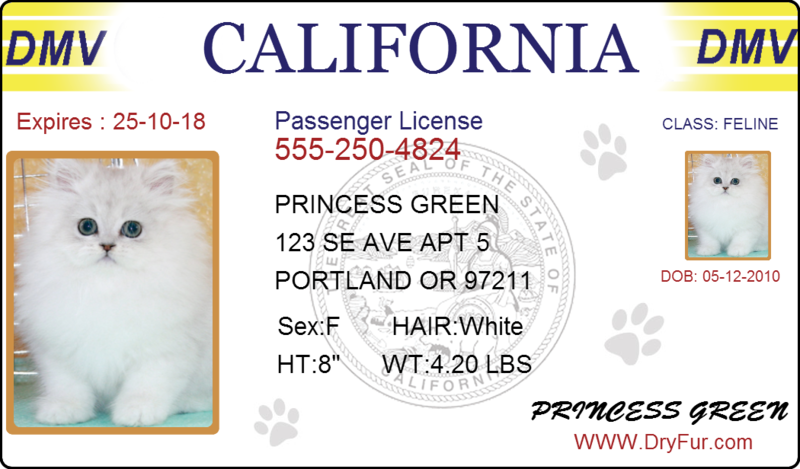 Fill in the Kennel Card with Pet’s & Owner’s Information. 4. Place the completed card squarely inside one of the laminating sleeves. 5. Place the plastic laminating sleeve with the card inside, between the front and back of the cotton tee shirt. 6. Firmly and evenly, press the hot iron on the tee shirt over the entire area of the plastic sleeve for about 30 seconds. 7. DO NOT remove the card immediately, it will be hot. Let the card cool inside the tee shirt for about a minute before removing. 8. Attach to kennel handle with releasable band provided. Purchased this for our dogs carry on kennel. Seems great, can't wait to fill it out and use it.